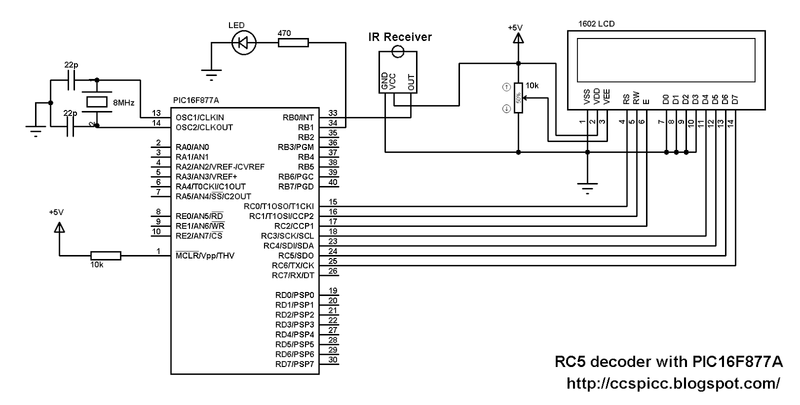 RC5 IR remote control protocol decoder using PIC16F877A microcontroller: This topic shows how to decode and get RC5 data of a TV remote control uses RC5 protocol with PIC16F877A microcontroller and CCS PIC C compiler. 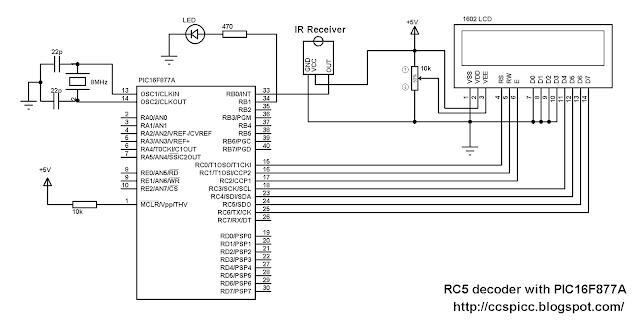 The IR receiver is used to receive the IR signals transmitted from the remote control and convert this signals to a digital data (logic 0, logic 1). The microcontroller PIC16F877A reads digital data from the IR receiver, this data is decoded and the results displayed on 1602 LCD display. The LED which is connected to RB1 pin blinks when RC5 protocol is received. 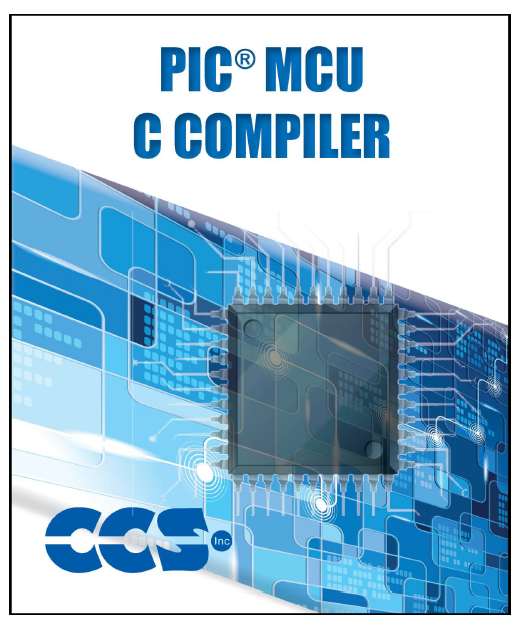 The microcontroller PIC18F4550 has two CCP modules CCP1 and CCP2, the CCP1 module is implemented as a standard CCP module with Enhanced PWM capabilities. These include the provision for 2 or 4 output channels, user-selectable polarity, dead-band control and automatic shutdown and restart. The Enhanced PWM mode provides additional PWM output options for a broader range of control applications. The module is a backward compatible version of the standard CCP module and offers up to four outputs, designated P1A through P1D. This topic shows how to use the enhanced PWM as a Full-Bridge Mode to control DC motor speed and direction. In Full-Bridge Output mode, four pins are used as outputs; however, only two outputs are active at a time. In the Forward mode, pin P1A is continuously active and pin P1D is modulated. In the Reverse mode, pin P1C is continuously active and pin P1B is modulated. P1A, P1B, P1C and P1D outputs are multiplexed with the PORTC<2>, PORTD<5>, PORTD<6> and PORTD<7> data latches. The TRISC<2>, TRISD<5>, TRISD<6> and TRISD<7> bits must be cleared to make the P1A, P1B, P1C and P1D pins outputs. 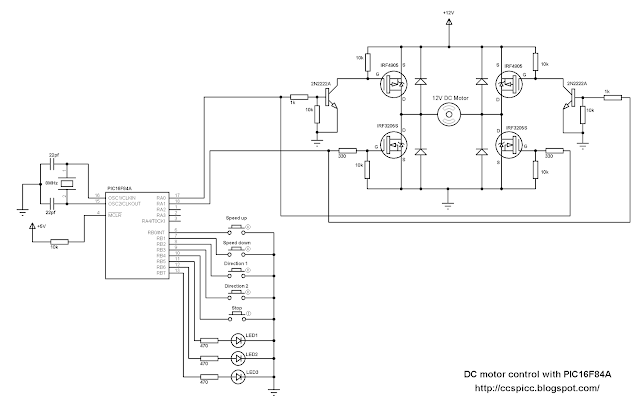 The motor speed is controlled when the PWM duty cycle changes. An H-Bridge circuit is used to reverse motor terminals which gives us the ability to change rotation direction. The following circuit schematic shows project circuit. PORTB internal weak pull-ups are enabled. There are 3 pushbuttons in the circuit 2 of them to choose rotation direction and the other one stops the motor. The two LEDs indicate rotation direction, if Direction 1 button is pressed the motor moves in the first direction and LED 1 on and the same thing for Direction 2 button and LED 2. The motor speed is controlled from potentiometer connected to RA0 (analog channel 0). 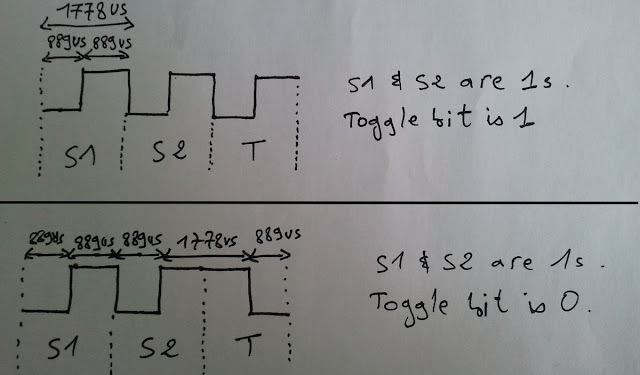 The microcontroller PIC18F4550 reads analog data from channel 0 and use the digital value to set the PWM duty cycle. The PWM frequency is 500Hz. The basic elements of the H-bridge are the four MOSFETs (2 N-type and 2 P-type). PIC18F4550 microcontroller internal oscillator is used and set to 8MHz. PIC18F4550 Timer2 is configured to generate a PWM frequency of 500Hz and the microcontroller runs with its internal oscillator at 8MHz. The microcontroller PIC18F4550 reads RA0 analog value and stores the digital value on variable (i), this variable is used to set the PWM duty cycle. The following video shows more about this project with hardware circuit. The microcontroller PIC16F877A has two CCP modules CCP1 and CCP2, these modules could be used as PWM yo generate two PWM signals. In this topic we are going to see how to use the two modules to control a DC motor speed and direction. And the direction of the DC motor can be controlled using H-Bridge circuit which allows us to reverse terminals polarity of the motor. 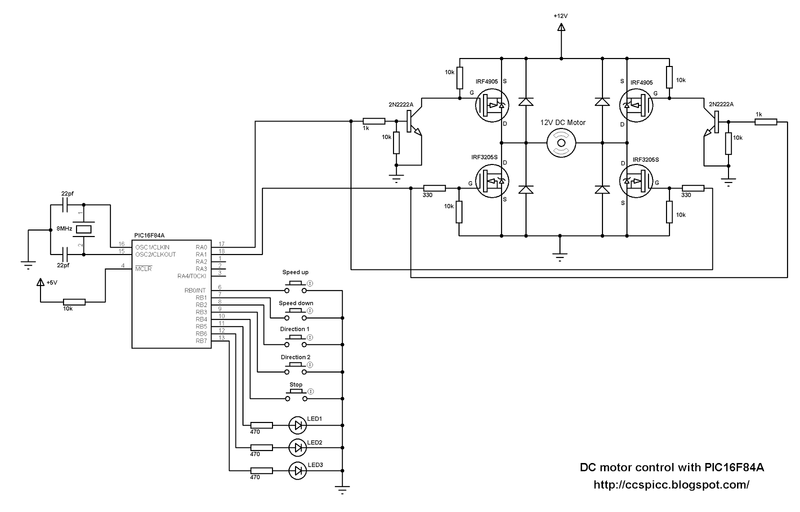 The following circuit schematic shows the full circuit of the project. There are 3 pushbuttons in the circuit 2 of them to choose rotation direction and the other one stops the motor. The two LEDs indicate rotation direction, if Direction 1 button is pressed the motor moves in the first direction and LED 1 on and the same thing for Direction 2 button and LED 2. The motor speed is controlled from potentiometer connected to RA0 (analog channel 0). The microcontroller PIC16F877A reads analog data from channel 0 and use the digital value to set the PWM duty cycle. If direction 1 button is pressed the microcontroller starts PWM1 (RC2 pin) and stops PWM2 (RC1 pin) and if direction 2 button is pressed the microcontroller stops PWM1 (RC2 pin) and starts PWM2 (RC1 pin), when the stop button is pressed the microcontroller stops PWM1 and PWM2 signals and the motor will stop. The PWM (PWM1 & 2) frequency is 500Hz. PIC16F877A Timer2 is configured to generate a PWM frequency of 500Hz and the microcontroller runs with 8MHz crystal oscillator. The microcontroller PIC16F877A reads RA0 analog value and stores the digital value on variable (i), this variable is used to set duty cycle of the active PWM (PWM1 or PWM2). We can control DC motor speed and direction using H-bridge circuit, the H-bridge circuit allows us to reverse power supply polarity and with PWM technique we can easily control the speed of the motor. 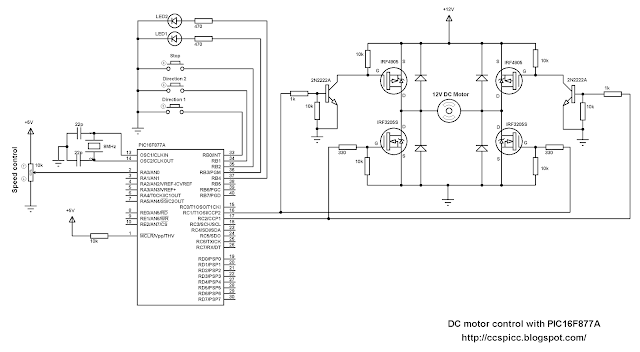 This topic shows how to control the speed and direction of 12V DC motor using PIC16F84A microcontroller and H-bridge circuit. The following circuit schematic shows the full circuit of the project with the H-bridge circuit. There are 3 LEDs, LED1 and LED2 are used to indicate motor direction rotation, and the other LED indicates maximum speed which means when it is on the motor runs at maximum speed. If the stop button pressed the motor stops and the 3 LEDs turned off.